Die Æsthetik der Herrschaftsfreiheit. A three disc journey into the hearts and minds of the oppressed. An album that has become more relevant to the happenings of this past year than band founder Jerome Reuter could possibly ever imagine. At it's core, it's a record of struggle and of overcoming the boundaries set by those in positions of power. Could this also be a deeply personal tome? The thoughts and feelings found within the three albums can be attributed to many an emotion, on a deeper level Die Æsthetik der Herrschaftsfreiheit might also be a massive metaphor for something much more intimate, love songs wrapped under cover of conflict. And so, carrying on where previous works Flowers From Exile (a story of the Spanish Civil War) and Nos Chants Perdus (the French Resistance) left off, Die Æsthetik der Herrschaftsfreiheit is truly a venture into the depths of the fight. Where to start with this release? Split into three separate yet ultimately cohesive parts, Rome's neo-folk take on the singer-songwriter genre is one of elegance and beauty. Leaving the more martial industrial sounds (yet never completely forgetting this piece of the bands history) of the past behind, we hear a somewhat more mellow sound, a little more acoustic work and some genuine moments of elation. There's always a huge worry in the back of your mind when a band announces that the next release is to be more than one complete record, especially when it's learnt that it will the three whole albums. The danger of over saturation, the pitfalls of keeping a tone and a story/concept running throughout two and a half hours of brand new music was a compelling yet apprehensive thought. And with having only released a full length in 2010, could Reuter deliver on what essentially be albums six, seven and eight of only a six year career? Yes. A wholehearted, resounding yes. Die Æsthetik der Herrschaftsfreiheit is beautiful, heartbreaking, thought provoking and can be taken as whole or as individual pieces. The three discs - Aufbruch or A Cross Of Wheat, Aufruhr or A Cross Of Fire and Aufgabe or A Cross Of Flowers - each have a distinctive feel and place. Each disc begins and end with spoken word parts, and interspersed on occasion are more of these speeches featuring the words of Bertolt Brecht and Pablo Neruda amongst others. Aufbruch or A Cross Of Wheat has more in common with Reuter's earlier works. A more bombastic sound underpins the works found here, that slight industrial beat binds with tracks that remind a listener of neo-folk greats Death In June, particularly on "Our Holy Rue," the vocal coming across more Douglas P. than anything else Rome have produced. The sound of gentle acoustic guitar carries this disc towards its conclusion. Gorgeous flourishes tinge "A Pact Of Blood," and heartbreak abounds in "In Cruel Fire." "The Merchant Fleet" features a more bass driven tone, minimal yet full, again the voice filling out the track perfectly - possibly the most important aspect of any Rome release is that voice. Able to dance from a more spoken style to sublime melodies, Jerome Reuter is in possession of a powerful instrument, telling a story just from the sound alone. Incredible. "Seeds Of Liberation" is the first track proper on second offering Aufruhr or A Cross Of Fire, possibly the more politically themed record in this trifecta. Seemingly the thrust of the narrative, this is a record telling of conflict - talking of rebellion and governance. "Sons Of Aeeth" leaps along on a simple martial beat and "August Spies" utilises superb string embellishments. "To Be Governed" is taken directly from a writing by French politician and socialist Pierre-Joseph Proudhon. A key influence on the Anarchist movement, he stood for the common man and for workers and peasants. An interesting piece to include on the record, it could be assumed that this particular work is for those people who feel oppressed by their governments, elected officials charged with the running of a country, and a world, that at the moment is in uproar. Writing these albums during moment of huge change for countries under the rule of dictators, countries rising up and taking on these "leaders," Reuter has taken on the thoughts of many - both past and present - thoughts that always seem relevant and produced an outstanding work of tales of resistance and for fighting for your freedoms and rights. Final disc then, Aufgabe or A Cross Of Flowers is likely the more reflective of the three records. Perhaps the calm after the storm of revolution, a time to ruminate on the happenings of the past and to learn and move forward. A sense of sadness seems to permeate this last record. The voice and concept tinged with a forlorn beauty, none more so than on "Petrograd Waltz." A palpable futility soaks the atmosphere, as if it is known that change - whilst it must happen - is still so very far away. "Ballots and Bullets" driving this point to it's hilt, these are not the things that will invoke change, it is the people that will do this. This album is again, a stripped back affair. Refined acoustic guitar work, gentle samples of strings and on the aforementioned "Petrograd Waltz" a glorious resonating bell is heard. 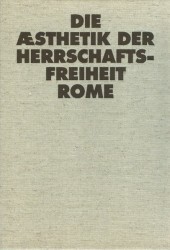 Die Æsthetik der Herrschaftsfreiheit is a piece of art, a provoking work on the state of the world today. It is a call to arms, to fight for your freedom, for your rights, for yourselves. Posted Dec. 19, 2011, 2:24 p.m.
Posted April 6, 2015, 3:03 a.m.